The human race is caught in the crosshairs of twin threats stemming from exponential advances in technology: easy access to weapons of mass destruction by terrorists, and the development of artificial intelligences that could take over our infrastructure. 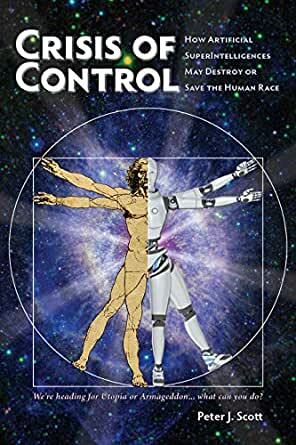 In Crisis of Control, Peter Scott lays out the stark choices and consequences facing us in clear, provocative, and sometimes humorous language. This book is for those with the courage to face unpleasant facts head-on: the stakes could not be higher. Yet there is hope, and Scott shows a path that might lead us through the crucible to a future of limitless promise. Those who usually talk about AI or artificial intelligence, might mention the dangers we might face, but rarely do you have someone actually explain it all in ways a non-technical audience can grasp. Author Peter Scott has written for high-tech readers, having produced a popular book on the Perl computer language, but here he does a fantastic job addressing the rest of us, breaking down what exactly AI is and how it is likely developing. But rather than a doom-and-gloom view of what many think AI's jump into some form of "consciousness" will lead to, Scott has a way forward that gives us hope. There is a path we can take, as he explains so well, that avoids the Terminator movies' disaster once the Robots get smart. This subject is so important to not only understand, but to begin to plan for some positive outcomes. Peter Scott faces this tremendous challenge and manages to guide his readers in what could just be the right direction. 5.0 out of 5 starsAlthough AI arrives tomorrow, we should start preparing for it today. What is AI? Well, a reasonable number of folks might answer that AI means "Artificial Intelligence." Okay, but what is that? Even fewer people might then explain that humans and animals have what we would call "Natural Intelligence," while machines have "Artificial Intelligence." Yes, we are talking about thinking machines. As machines become smaller and faster, will they eventually be able to mimic "thinking" in the way that humans do? We get the impression from myriad science fiction movies that this development is just around the corner! But these stories were written to entertain by writers who probably have little real knowledge about AI. For the state of true AI progress (as of today), there are researchers who might tell us... But if their work is proprietary they won't reveal much, and what they do tell us is likely to be very technical and difficult to understand. Now Peter Scott steps into the scene. Combining his extensive technical background with excellent story-telling tools, Peter explains AI for us: Where we are right now and what we should expect down the road. Of course, nobody can predict the future, but Peter knows enough about the subject to make well-educated guesses. Will AI be humanity's best friend or will it take over the Earth and destroy us? Peter knows what we should be doing to assure that AI is beneficial and not harmful to humanity. He stresses that AI is coming, whether we like it or not. Peter tells us what we should be doing beforehand, so that AI's arrival is well received and not something catastrophic. Full disclosure: I've known the author for many years. I've had the privilege of working with him and have enormous respect for his technical prowess and intellect. In that regard, this book didn't disappoint. Peter Scott provides a broad and substantial foundation for his forecasts. And even though I have great difficulty accepting the notion of a conscious artificial intelligence, the author presents some very compelling arguments that are difficult to dismiss. In many ways, this is a very frightening book. Although the author discusses the possibility of a very benevolent outcome, it is dependent on the foresight and wisdom of political/technical leadership. Nevertheless, this book adds a fascinating perspective on the quest for a conscious artificial intelligence. Great for anyone wanting a better idea of what the future holds especially as artificial intelligence / machine learning take off. I like books that not only make predictions but back those predictions up with logic and evidence and this book does an excellent job of this.